The laughing queen that caught the world’s great hands. “A budget priced tent for sheltered summer use aimed at youngsters seeking their first camping adventure, perhaps in the back garden”. Summer use! Back Garden! Nowhere did it mention wild camping for nine months in the toughest and most unforgiving continent on earth. We bought another. 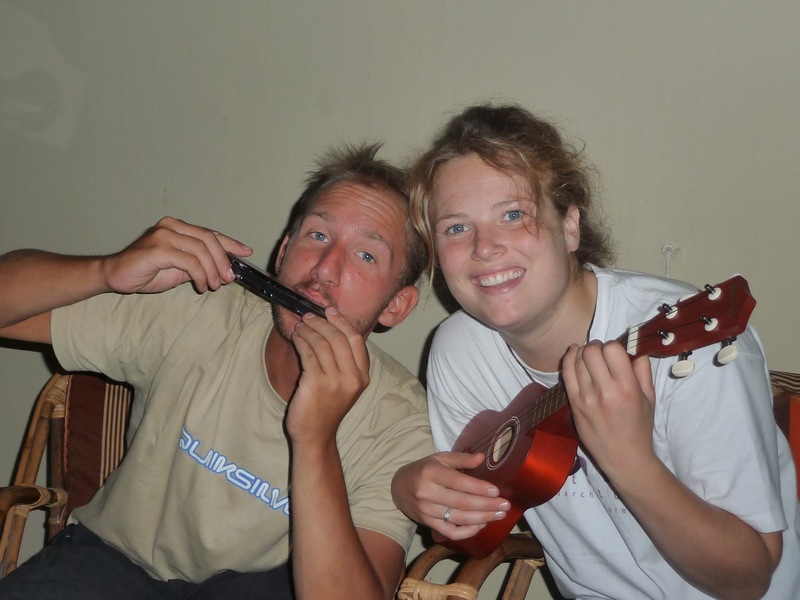 I realised though that the ukulele was a nice touch. Not wanting to be outdone I hot footed it to a local music shop and purchased not one, but two, fine harmonicas. We have started up a traveling band. Neither of us have any clue about how to play either instrument and what’s more we have nobody to teach us and no text to learn from. But we do have time and enthusiasm. Surely that’s all we really need. We need a name for our traveling band. Please leave suggestions in the comments section below. In Cairo we made our final preparations for the road ahead and explored the city on foot. Our first task was to secure VISAs for Sudan and Ethiopia. The Sudanese required a ‘letter of intent’ from the British embassy. We collected the letter, which was actually a letter stating that the British Embassy do not issue ‘letters of intent’. It cost 30 quid for the privilege on top of the one hundred US dollars for the Sudanese VISA. 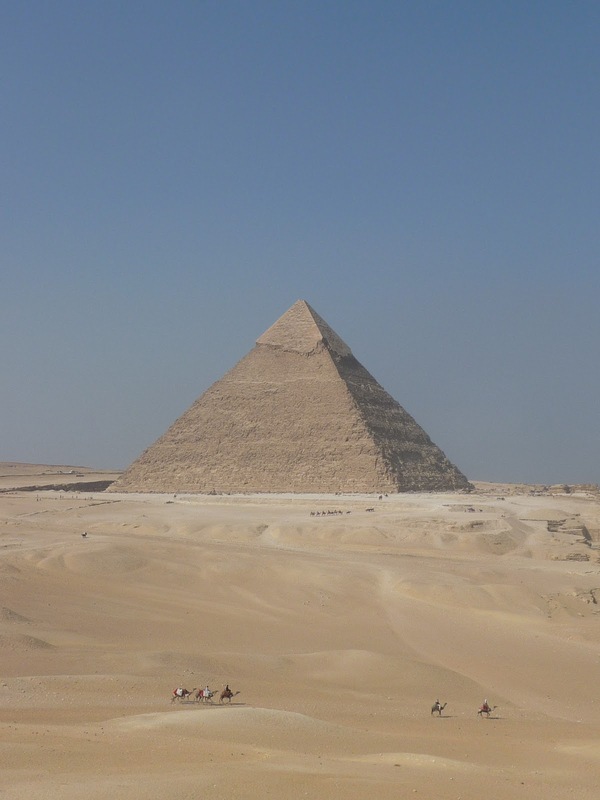 We visited the pyramids with an Australian fine dining chef called Damian who was about to start running across Africa. 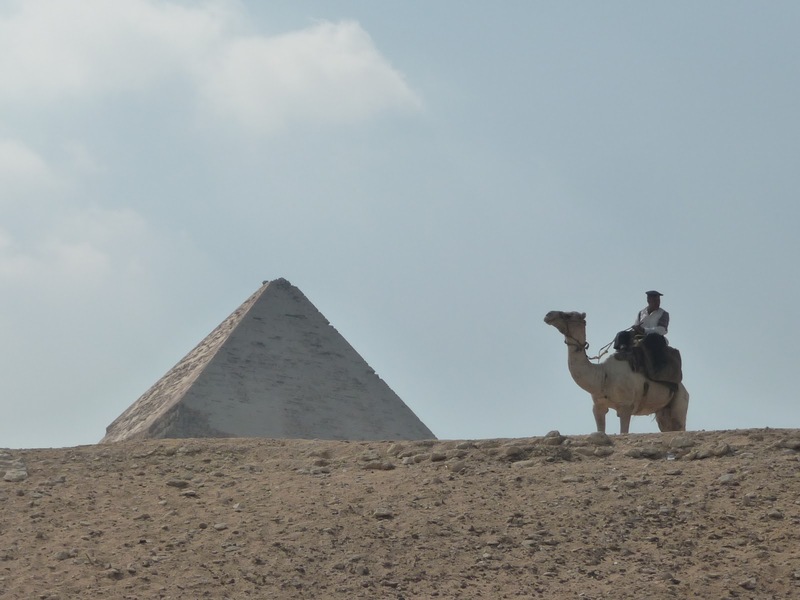 We decided against taking a camel ride even if getting around the pyramids, according to the touts, “is very far on foot”. In the evenings we chilled out in Al-Azhar park, chatting with young Egyptians and contemplating how young life here contrasts with our own in England. We were having fun but I was keen to get going. 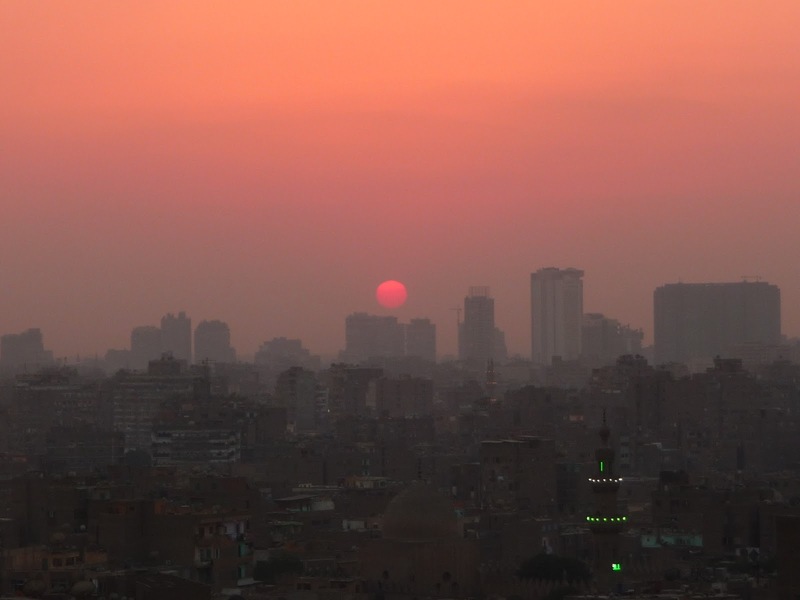 Cairo can be a hard place to find peace. In a crowded city of twenty million arguments can quickly erupt between locals, the barmy din of car horns and voluminous touts permeates every moment and mosquitoes and smog hang in the air. Perhaps it was a reaction to the surrounding chaos but I realised we were undergoing a subtle transformation. Ny started dreading her hair. My beard was making a comeback. We ate falafel and smoked shisha. I practiced the harmonica. We talked about how to sleep for free in Cairo. If we had continued in this hippie-esque vain we may have ended up dancing naked around central Cairo with flowers in our hair, so I was relieved when finally our panniers were packed and we knew the location of every spoon, every pair of socks and every spare spoke. 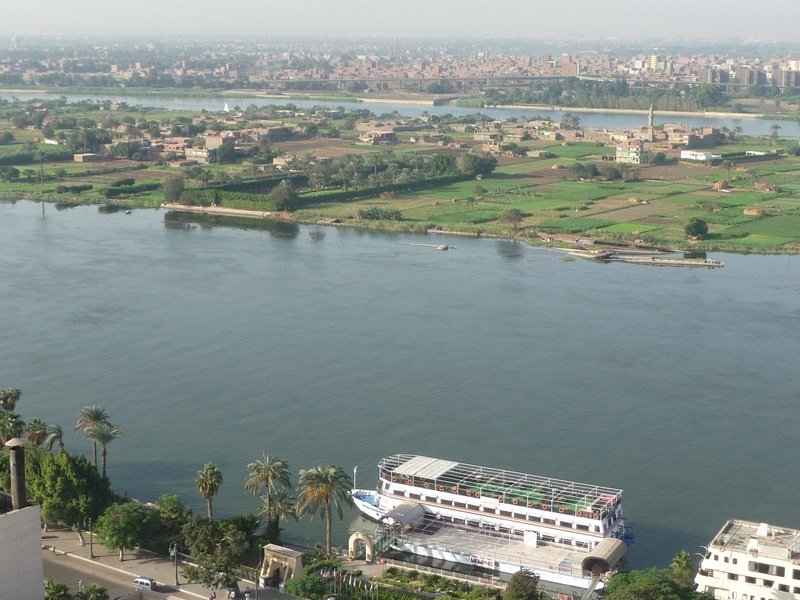 The Nile would be our guiding companion for the next two thousand kilometres. We would shadow her twists and turns. The prevailing wind is brisk and blows reliably towards the south. Surely at least the cycling would be easy along her flat fertile flood plain, although I suspected our ride along the mighty river, like most things in Africa, would not be that straight forward. We were off, a curious, grinning, two-person peloton. At first we weaved our way through the industrial outskirts and through the grimy detritus caste aside by Cairo’s burgeoning population. Little by little the traffic thinned and settlements became punctuated with greenery and pastures. The dusty road became an avenue lined with palm trees, prickly pear and sugar cane. Grey herons flew high over our heads and excitable ten year olds whooshed past our shoulders on motorbikes shouting “weeeeeeeeeelcoooooommmmeee!”. I took a long look at Nyomi. She sat proudly aloft her heavily laden touring bike wearing a large green rimmed hat. Two dreadlocks protruded from under the rim and were at right angles to her head. A piece of luminous yellow and green twine was tied into her hair. She had several spring onions and a large cucumber strapped under the bungees on the back of her bike and a ukulele was strapped to her back. On the front of her bike tied to the handlebar bag was a bright yellow metal plate emblazoned with the words “I DON’T BRAKE FOR ANYONE’. I realised at that moment that the question was not whether we were ready for Africa, but whether Africa was ready for Nyomi. On our second evening we turned off the main road, found a nice patch of grass to camp and were soon surrounded by cheerful, tittering, curious faces watching us keenly as we ate and then erected the tents. We felt, above all, safe and secure here. But the night of Halloween was drawing in, all those friendly faces soon disappeared behind the locked doors of their homes and our situation changed. The sound of motorbikes zooming close by kept me from slumber. A group of seventeen and eighteen year olds approached the tent. I poked my head out to explain we needed some sleep. They skulked away out of sight. Then, a little later I heard some scuffling at the tent porch, a quick count and a pannier was missing. I went outside and found them rifling through Nyomi’s clothes. They saw me and quickly retreated but I had a feeling they’d be back so I sat vigil outside the tent. Again they came, now more aggressive, demanding money and making threats, again I ushered them away. I mentally sorted through our options and was left short changed. Again they came back but now with additions to the party, four or five more lads, two brandishing large sticks. They had upped the ante, diplomacy had failed and I had some very quick decisions to make. I had some CS gas and a knife in my tent. Adding either to the mix could only make things worse. Then I spied two figures walking down the road. Perhaps they would help us. I shouted for Nyomi to run over and enlist their help whilst I tried to stop the group raiding our stuff. The two lads got involved, pushing the boys back and shouting with menace. It was brave thing to do. Our assistants cant have been much older then those in the group. Slowly the group dispersed. An old man appeared after hearing the commotion. He introduced me to his friend, a lean, grim character clad in a long brown robe and with a full beard. He lit a fire close to our tent and placed a foot long curved knife on his lap. He would act as our protector and bodyguard through the night. We paid him some baksheesh for his trouble the following day. The next day I knew we had to metaphorically, as well as physically, get back on the bike so we found another village to rough camp in the evening and this time it was a much less restless night’s sleep. We were welcomed by a large extended family. We sat munching on sugar cane with the children and a cow was milked so that we had something to drink. Nyomi rode around on a donkey to everyone’s delight and amusement. We watched the sun set over the palm trees, sat around a fire and then when bed time came the villagers moved a water buffalo from it’s shed so we could sleep there. A man and woman living and traveling together for nine months, but not as boyfriend and girlfriend, is a concept that would be completely lost on most people in Islamic Egypt. So to prevent confusion, to ward off the attentions of Egypt’s many many leering romantics and to make life easier we pretend we are married and Nyomi wears a ring. Now that I have a cycling buddy to consider I have had to adapt after my slightly self-absorbed and solitary life before Cairo. I was glad Nyomi had done some training in the UK before she left and she has had no trouble on our first days on the road, easily keeping pace. What’s even more impressive has been her ability to match me mouthful for mouthful at breakfast, lunch and dinner. In Egypt we have the perfect leg fuel… Koshary. It’s a mixture of pasta, rice, tomato sauce, dried onions, garlic sauce, chick peas and chilli sauce. Tasty, loads of carbs, dirt cheap and available in every town and on virtually every street. Of all the Stephen’s in all the world it’s not Steven Speilberg, Stephen King or even Professor Stephen Hawking but the WWF wrestler ‘Stone Cold’ Steve Austin who is my most well known namesake. Although some grated, most of the police I met were friendly and of course only doing their job, and when they drove in front and sounded the siren as we rode into town I couldn’t help feeling quite presidential. They were also helpful when I had to stop to fix a puncture and a mob of children descended. They began helping me change the tyre but their hands were everywhere and I noticed a few sniffing around my handlebar bag. The cheap inner tube had completely ruptured, the split ran right through the words ‘made in China’. With the flat fixed I readied to go but realised my speedometer was missing. I erupted into a loud tirade, after a few minutes the speedo was returned but they wanted money for their ‘find’. At this point a policeman appeared and doled out a few clouts to the nearest youngsters who quickly scarpered. During that evening I started to feel sick and the next day was the first on my journey where I have been physically unable to ride. I had a blistering headache, rigors, severe diarrhoea and my temperature intermittently spiked to 39 degrees. We rested up in a shabby hotel whilst I self medicated from my pannier pharmacy (‘borrowed’ from my hospital) and winged to Nyomi. But the next day we pressed on. Eventually we cruised into Luxor at the end of a healthy one hundred and forty five kilometre day. Shower, koshary, feet up, beer. We hadn’t seen another tourist over the seven hundred kilometres we’d ridden from Cairo, but Luxor was packed full of backpackers. At the infamous Valley of the Kings I watched tour bus after tour bus arrive with amusement. Out piled elderly American and French package tourists. Clearly they had all been given some sort of instruction by the on board tour guide. The last stage through Egypt was Luxor to Aswan at which point we planned to take a ferry across lake Nasser to Sudan. The road south to Aswan was lined by flowering plants of effulgent hue, beyond them crops of oil palm, cabbages and sugar cane. Traffic at last was sparse but there were more police around than usual, and for Egypt that’s a lot. Susan Mubarak, the wife of the president, was visiting a village nearby. In Aswan we took a ride in a felucca along the Nile and made the necessary adjustments for the next stage. Chunkier tyres for the less salubrious terrain ahead, stashes of cash hidden around our panniers (it would be maybe two months until the next ATM) and new maps. On Saturday we take a ferry across the lake to Sudan and then I have a feeling that life’s about to get a little less comfortable. My next post will come from Khartoum. Already much of those words ring true. The cycling has been easy but even so it’s been a tough start to our African epic. We’ve been sick, we’ve been threatened and we’ve been robbed but we’ve also been surprised, inspired and often overwhelmed. Already we have stories. I can’t imagine how many more we’ll have to tell in Cape Town. There’s no doubt in my mind that we are lucky, lucky gits. This was the ‘bike shop’ we were directed to. Four guys and a box of tools camped out on the street corner. Ah Egypt, beguiling, frustrating and chaotic. You were right not to add your weapons to the mix. I'd a similar situation in Iran, I too was rescued by a group assembled from the benign 99%, and I reckoned that a mashad hoodlum would probably fare better in a knife fight than myself. Fair play for getting back on the bike and not letting the experience colour your world view. I'm on the verge of proposing to Nyomi myself, so good thing she's already married to you. Are we into wife sharing? Do tell. Names for the band? I have only cheesy ideas: The Pelotonen PanPipe Panniers, The Tandem Tooters, The Nile Knockabouts. Or maybe just the group I'm listening to right now: The Gear Daddies. The Harmonibikeleles? The Bikeharmoleles? Just the Bikeleles? Please note that the "ke" somewhere in the middle of each name is pronounced "keh". What an adventure! really enjoyed reading about the latest adventures. it is a hoot to read. so glad nyomi is cycling with you now – she sounds wonderful.